Four suspects are behind bars after committing a string of armed robberies, aggravated assault, and shooting at bystanders in West Phoenix on Friday afternoon. 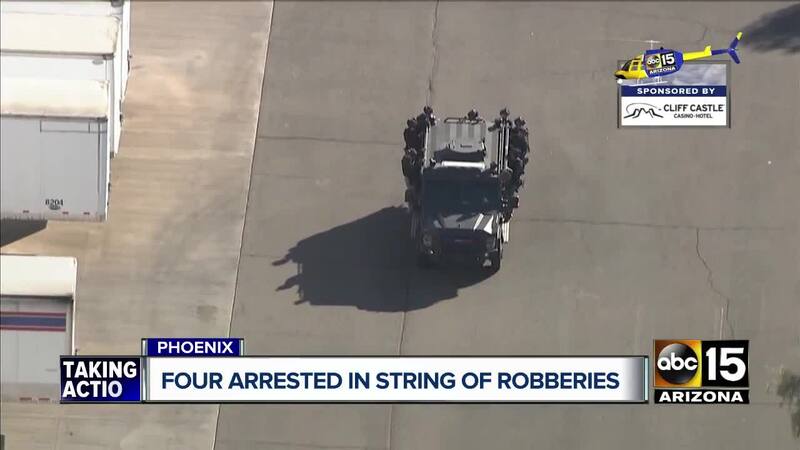 PHOENIX — Four suspects are behind bars accused of committing a string of armed robberies, aggravated assault, and shooting at bystanders in West Phoenix on Friday afternoon. According to Phoenix police officials, officers first responded to reports of an aggravated assault in the area of 51st Avenue and Van Buren Street around 1 p.m. The victim told police that a male suspect pointed a gun at him and had shot at a nearby bus before fleeing the scene in a black SUV. Police said nobody was injured. While officers were at this scene; however, police received two additional calls describing the same suspect vehicle. At 1:15 p.m., police received a call that suspects were shooting randomly at people in the area of 68th Avenue and Lower Buckeye Road. The suspect vehicle matched the description from the vehicle that fled from the first incident. Police responded to the scene and found evidence that shots had been fired, but the suspects had already fled. Nobody was found injured at this scene. Officials say 15 minutes later, a person called and said two suspects held them at gunpoint in the area of 66th Avenue and Yuma Road and had taken some of their property before fleeing. One of the suspects and vehicle description reportedly matched the same as the two other incidents. Then, at 1:50 p.m. an officer recognized the suspect vehicle near 83rd avenue and Van Buren Street and attempted to stop the vehicle, but the suspects fled and crashed behind a business complex. Four suspects ran from the vehicle, but were all apprehended and taken into custody after police established a perimeter in the area. Two suspects were found inside a nearby dumpster, one was found near the crash scene, and the last suspect was found inside a business armed with a rifle, according to police. Police say one of the robbery victims was a 14-year-old who was not injured. Police said there are no other outstanding suspects, and it was later discovered that the suspect vehicle had been reported stolen from Tolleson. Information regarding what charges the suspects will be facing was not immediately available. The identities of the suspects has yet to be released.